...... The user-friendly and understandable interface is convenient for both experts and home users. SuperEZ Wave Editor is a multiple program and enables you to record any sound from computer's sound card, like voice, MP3, WAV, etc. 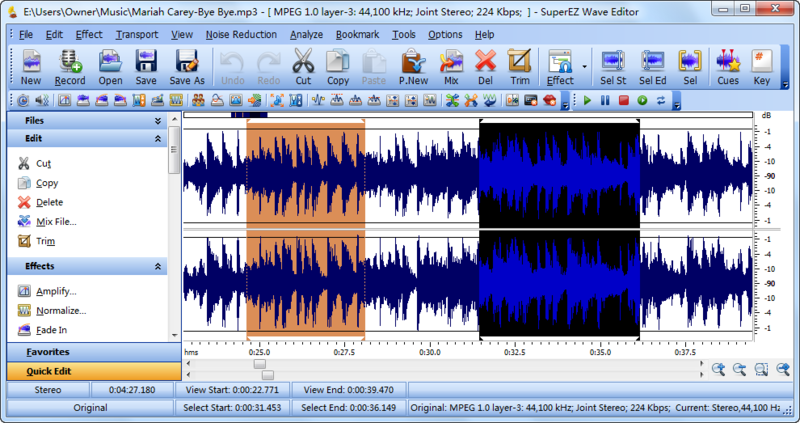 SuperEZ Wave Editor is an advanced music and audio editing solution for pros and amateurs. You are allowed to perform all classic audio editing functions including cut, copy, paste, trim, delete, undo, redo, etc. with amazing ease. SuperEZ Wave Editor presents you the skill to create your own symphony of favorite songs for your listening pleasure by adding some audio effects. Qweas is providing links to SuperEZ Wave Editor 11.3.1 as a courtesy, and makes no representations regarding SuperEZ Wave Editor or any other applications or any information related thereto. Any questions, complaints or claims regarding this application SuperEZ Wave Editor 11.3.1 must be directed to the appropriate software vendor. You may click the publisher link of SuperEZ Wave Editor on the top of this page to get more details about the vendor.